The western states were the first to allow women the right to vote, a freedom that grew out of the less deeply entrenched gendered spheres in the region. This illustration, from 1915, shows a suffragist holding a torch over the western states and inviting the beckoning women from the rest of the country to join her. Women’s suffrage was one of many causes that emerged in the Progressive Era, as Americans confronted the numerous challenges of the late nineteenth century. Starting in the late 1800s, women increasingly were working outside the home—a task almost always done for money, not empowerment—as well as pursuing higher education, both at universities that were beginning to allow women to enroll and at female-only schools. Often, it was educated middle-class women with more time and resources that took up causes such as child labor and family health. As more women led new organizations or institutions, such as the settlement houses, they grew to have a greater voice on issues of social change. By the turn of the century, a strong movement had formed to advocate for a woman’s right to vote. For three decades, suffragist groups pushed for legislation to give women the right to vote in every state. 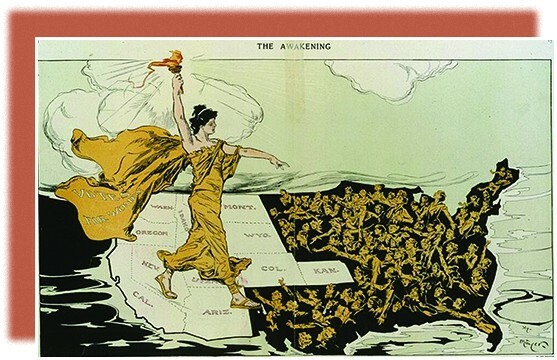 As the illustration above shows, the western states were the first to grant women the right to vote; it would not be until 1920 that the nation would extend that right to all women.